Getting married is exciting, and it’s not just the wedding that you have to look forward to. Your loved ones tend to go nuts on showering you with gifts – they’re pleased for you and want to celebrate you both. Of course, these gifts can come in handy for many younger couples who are establishing households, or wanting to upgrade from the cheap hand me downs that’ve seen better days. 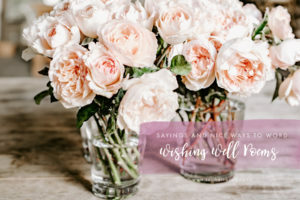 One way that you can get gifts that’ll suit your tastes and needs – and help your guests with what to choose – is to have a wedding gift registry. The premise is simple. 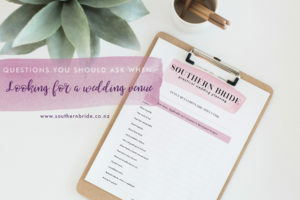 You visit a department store, pick a range of items that you’d love to own (preferably in a few different price ranges, to cater to your different guests) and then let your wedding guests know where they can find your registry. You are even able to “register” with online stores who then ship you the haul all in one go. Pretty handy! 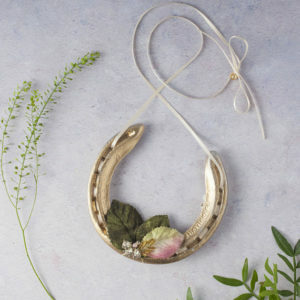 Some couples want to skip the gifts all together, and request cash – a more common euphamisim is a “wishing well” or a “money tree”. 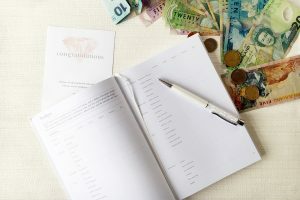 I touch on how to ask for cash politely (and some different ways to word it) in this article here. 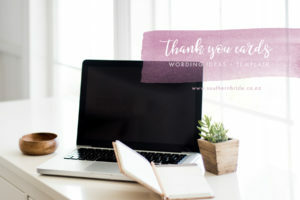 But today I’m sharing some different ways of working that you’re having a registry. Grab the full list of registry & wishing well poems here. 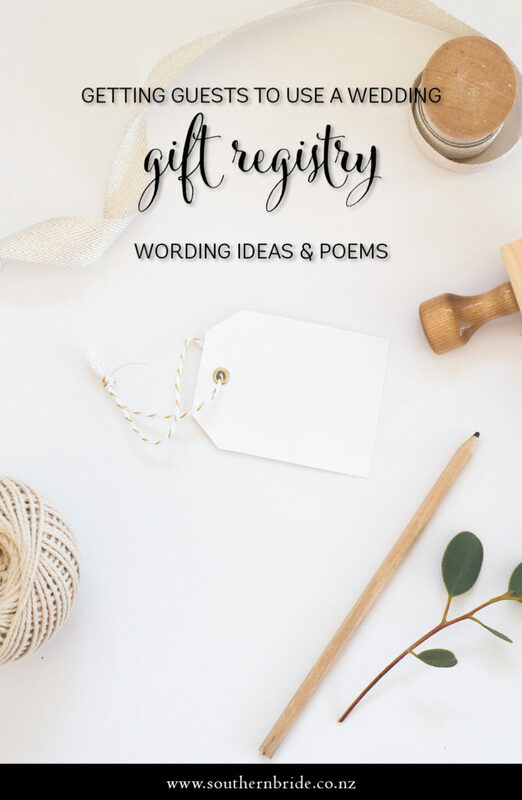 Below is a few gift registry wording ideas and poems for you to use. Or download a full list of registry and wishing well poems (even more than below) in an easy to edit/copy/paste format here. (Partner1) and (Partner2) are already blessed with much love, laughter and half a household of furniture! Accordingly they have assembled a registry for the items they’d find most useful. If choosing a gift is not your cup of tea, you might like to try our gift registry. Please feel no obligation to use this list, as we do not mind if you give it a miss. You can view it online at (website) and enter our registry ID number. Your presence at our Wedding is the greatest gift of all. However, if you wish to honour us with a gift, we have registered a list with (shop). You can view it online by entering (reference number), or at any store. Please be aware that gifts are not necessary. Your presence is all that is required. 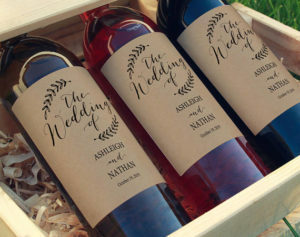 However, for your convenience (bride) and (groom) have prepared a gift registry. If choosing a gift is not your cup of tea, you might like to try our gift registry. Please feel no obligation to use this list, as we do not mind if you give it a miss. You can view it online at (website) and enter our registry ID number. Many friends and family have asked for gift suggestions. As we already have many items to start off our new lives together, we have created a registry with (store). The list can be viewed online with reference number (details). 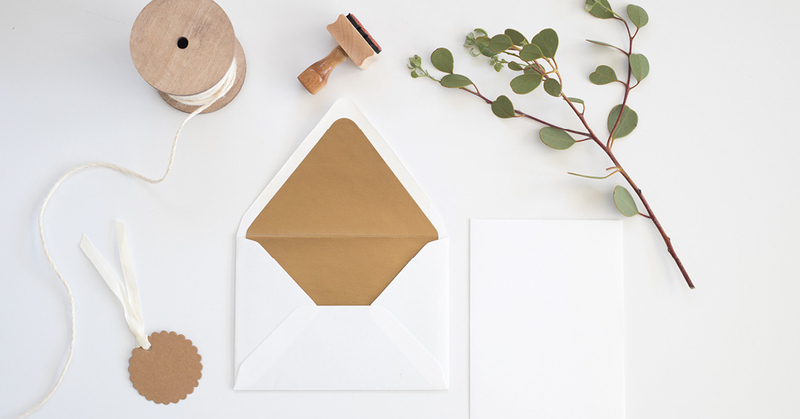 Should you wish to honour us with a gift, we hope that our registry held at (store) will make it more convenient for you to select something that you know we will love. The list can be viewed online at (address) with details (details). Do I need to inform guests it’s a cash bar only? 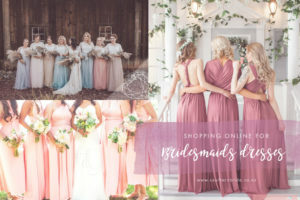 When should the bride have their wedding makeup done? They are so inspiring and they are totally going to help me for the season! 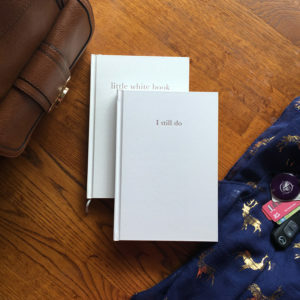 Thank you – fantastic ideas – helped out so much with the wording for the registry!! Thank you so much! this is very helpful to me. I’m making now my wedding invitation. Thank you!! !